Busy Bee buzzing around like a Chicken with its head cut off! Found this image on the net! Pardon the poor quality. 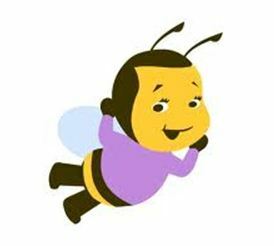 I figured, if I were an actual bee, this is what I might look like, yes? Wow, that is some powerful imagery, eh? The Asterisk SF Art & Design Issue is available! Many sleepless nights but it was all worth it. It was a tremendous learning experience and helping artists gain more exposure was a great benefit of the overall work. Blogging regularly for Gray Area Foundation for the Arts (GAFFTA)! I have volunteered with this organization for some time and its been wonderful to see and experience all the great things happening with this organization. It’s even more awesome meeting and corresponding with GAFFTA faculty who teach artists, musicians, and creative technologists a multitude of skills from programming to creative coding to integrating older and newer technologies (i.e., paper-based electronics!! Watch out for that post on the GAFFTA blog!). Still blogging with ZERO1 and anticipating the ZERO1 biennial!! The biennial will be from September to December 2012 and with so many amazing artists on the roster and pop-up exhibitions throughout the Bay Area, I’m really excited to write profiles for some of the biennial artists!! I won’t reveal them just yet BUT they’re doing some phenomenal things in arts and technology!!! Most importantly, I’m looking forward to facilitating a blogging workshop with ZERO1 art ambassadors. They are a young and talented bunch that will be covering the biennial events and festivities. It will be great working with them and seeing arts and technology through their eyes and perspectives. Still working hard on all fronts BUT the greatest test will start in Septemeber…graduate school! Yup, you’re probably thinking, “Damn, this woman is crazy”. Well, yeah, you’re right. I’m one of those people who likes being busy BUT it’s time. I’m excited, anxious, nervous, and happy that I will be starting this new chapter in my life. Talk about “hit-the-ground-runnning”! I know, I’m filled with clichés. Horrible. I know but they’re easy and get straight to the point. Posted in Observations and tagged as art writing, blogging, writing practice. I’m just thinking out loud wondering how to disseminate information like that out to other media groups. Like, for example R/GA. Though nonplussed and impressed by the goings on in your field. I’m honored to be graced with the bodacity to be a constant 2₵ contributor. “Wonder Woman” is right! Exactly mel1nda. Dorothy, I do have once concern about the bee. It has not fancy frames. I’d like to take a moment again to thank you for your dedication to the arts and community. Your work, your uplifting approach, in my mind, is a template any blogger in any city, town, village or even, rural county could use to create discourse. Your effort honors the work of so many. SF is lucky to have you. In New York, my home state, artists are working furiously to fight franking. https://vimeo.com/44367635, http://www.rollingstone.com/music/news/new-york-musicians-to-fight-fracking-at-albany-rally-20120514, http://video.nytimes.com/video/2012/07/05/opinion/100000001648803/songs-against-drilling.html, http://www.frackaction.com/. We’re trying very hard to merge the power of creatives on all fronts with not only opposition but promotion of positive movements. Have you witnessed such a merging in the SF Bay area? Archaelogists Sam Fuchs and Adam Gray are no doubt skillful and talented- they’re like Picasso. I’m sure, although the bulk of their art works are collections of collages, they’re not just thrown in together like a Paella dish, but each work no doubt has meaning and intention. There is order and arrangement in these particular carefully constructed pieces of high-brow trash. It’s an honest, bodacious highly-charged and electrifying cartoon hell. The art of Paul Madonna “Cartooning Life’s Poetic Moments” is no joke. His obviously skillful use of materials produce images that are sophisticated, familiar and haunting and creatively philosophical. I wonder if Johanna Poethig has the pocket-size astrological wheel that has 86 positions one can reference for sexual activity? I love the birds picture and the cupcake frosting picture. The alchemist speaks, like a talented watercolor artists that used to have his prints in textbooks. I think that all of these demand an extraordinary amount of patience as well as skill.